There is a clever way to keep all Microsoft‘s top features for power-users and still be cost-effective at enterprise scale. Let’s be honest, how many of your employees are using most of the Office 365 features? Twenty percent? Ten? There is no reason to keep them on the high-end subscription plan. And that’s why we have created paralleldeployment. Parallel deployment is simple. For management and more demanding users,you keep Office 365, Exchange or G Suite. 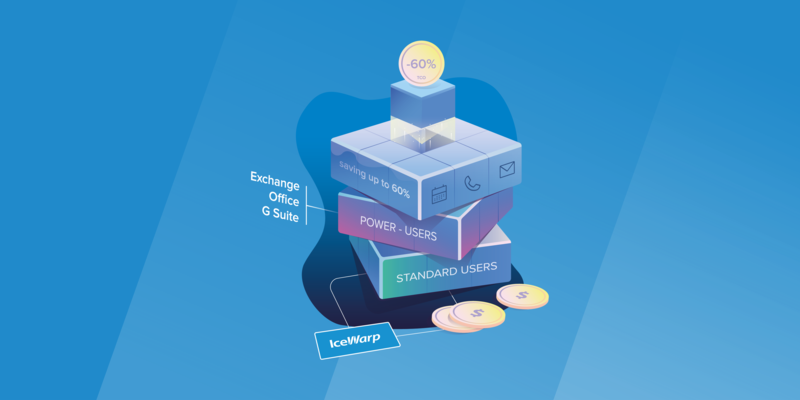 And for the rest of your enterprise, there is an easier to use solution than Microsoft’s heavyweight environment – IceWarp WebClient. In short, parallel deployment consists of two autonomous servers. One for Office 365, Exchange or G Suite. The other for IceWarp. One of them is set as the main server, the second as a backup. They share one user account directory and the same domain name. The connection between them is established by forwarding the outputs coming into the main server. Both servers have their own security protocols for outside threats as well as for communication with each other. There is no security weakness in parallel deployment whatsoever. Make no mistake, IceWarp is a fully operational office suite. It has advanced options for Email, Calendar, and Contacts. WebDocumentsmeets the requirements for any office work you can imagine. Instant messaging will surprise you with Audio&Video Calls and its integritywith Microsoft Lync. And there is a unique tool called TeamChat too. With TeamChat, a project-based social network, you can communicate with the rest of your team in separate chat rooms. Thanks to email and TeamChat integration you can extend its possibilities even further, even to outside your company. And best of all, it can lower your overall costs by 60 %!